SOUTHAMPTON, N.Y. — Longtime Hillary Clinton aide Huma Abedin has won plaudits for her campaign instincts, her deep-rooted loyalty and her glamorous personal style. But she has been pushed into the spotlight for another attribute — as a wronged political wife. It wasn’t the first time Abedin was confronted with her husband’s raunchy recklessness. Declaring the marriage over, Abedin said in a statement that she had decided to separate from Weiner “after long and painful consideration and work on my marriage.” The couple has a young son, Jordan. The 41-year-old Abedin, now vice chairwoman of Clinton’s campaign, began working for the former first lady while a student at George Washington University in 1996. Her role deepened as Clinton won a New York Senate seat in 2000, ran for president in 2008 and later served as President Barack Obama’s secretary of state. “With Huma, her grace, her intellect and her humility have been unmatched as I’ve watched her go from an aide to an adviser to one of the people at the top of my campaign,” Clinton said in a recent profile of Abedin in Vogue. With roughly two months to Election Day, Abedin is Clinton’s near-constant travel companion and has long exerted great influence within Clinton’s inner circle — a role in which she is expected to continue should Clinton win the White House. Few major decisions in the campaign are made without Abedin’s input, and she remains an important back-channel in the Clinton orbit of friends, political allies and donors. Stylish and poised, Abedin carries enough clout within Clinton circles to headline high-profile fundraisers, as she did in 2015 alongside Vogue editor-in-chief Anna Wintour in Paris, raising money from Americans living abroad. She’s close enough to the Clintons that former President Bill Clinton officiated when Abedin and Weiner married in 2010. Before The New York Post published photos late Sunday that it said Weiner sent last year to a woman identified as a “40-something divorcee,” Abedin was spotted outside a Clinton fundraiser at the Southampton home of philanthropist Marcia Riklis. A friend of Abedin, who spoke on condition of anonymity because of the sensitivity of the breakup, said she was with her young son, Jordan, and her family members in the Hamptons during the weekend. Abedin’s friend said the separation from Weiner had been brewing for some time. Abedin’s behind-the-scenes role has often drawn unwanted attention. Her email exchanges with Clinton were closely scrutinized during the Justice Department’s investigation into Clinton’s use of a private email server. Federal prosecutors ultimately declined to issue charges in the cases. Crown Prince Salman had made a $32 million commitment to the Clinton Global Initiative, a program run by the foundation. Copies of Clinton’s calendar obtained by AP confirm the meeting occurred in her State Department office on June 26, 2009. The State Department has said there was nothing improper or unusual about the messages with Clinton Foundation staff. 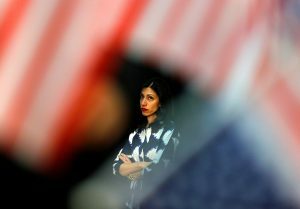 Abedin’s marriage has also come under fire from Clinton’s Republican opponent Donald Trump, who immediately seized on the aide’s marital split to accuse Clinton of “bad judgment.” He suggested that Weiner might have compromised national security, but offered no evidence to support the allegation. Associated Press writer Jennifer Peltz contributed from New York.